Jingwansa Temple was first built in 1101 during King Hyeonjong's reign of the Goryeo Dynasty. Jinkwansa Temple was first built in 1101 during King Hyeonjong's reign of the Goryeo Dynasty. In 1403, Suryuksa Temple was built on the ruins of the original temple in memory of the nation's founders. 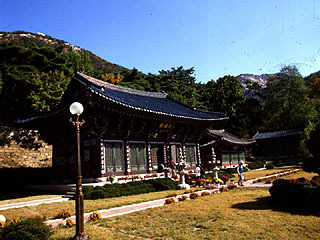 After it was burnt down during the Korean War, female Buddhist monk Jin-kwan rebuilt it in 1964. Now it is a temple for women monks, and about 15 women monks live there. When you enter the compound, the main hall appears in front of you with living quarters on your left and small halls on your right. The first hall contains Kstitigarbha with all the judges, the Sec is the abode of the Mountain God and the Recluse, the third is where people light lamps in memory of the departed, and the last is Amitab-ha's shrine, with all the enlightened disciples.